« Week 2 of Marathon Training. The Goodness of Carbs. Also: Hummingbirds! Chili is supposed to be a wintertime meal, a perfect dish for those long, dark evenings when you’re all cozy on the couch with a hot steaming bowl of this velvety goodness … Well, I’ve never been a fan of limiting deliciousness, so why not give it a try in the summer? I first read about the idea of adding a hearty grain to a vegan chili recipe in Scott Jurek’s book, Eat and Run. In the book, Scott admits to never having liked chili before until he tried a chili recipe with grains. According to Scott, they can give a vegan chili that heartiness that meat chilis have. He provides a recipe that he calls Minnesota Winter Chili and suggests using bulgur wheat along with beans and other ingredients. It took a few attempts to make it just right, but finally I have it! Meet my Three Bean Barley Chili – perfectly hearty, filling, smoky, spicy, but never so heavy that you have to take a nap after having a couple bowls! Hooray to the power of plants! This chili is smoky, spicy, filling, and very satisfying! Feel free to use any combination of cooked or canned beans: black, kidney or cannellini work well in this recipe. You can also try another type of whole grain, preferably the kind that takes at least 30 min to cook. Heat a big saucepan over medium heat. Add a couple Tbsp of vegetable broth or water to the bottom of the pan. When the broth/water start bubbling, add onions, celery, carrots, and parsnip. Sautee for 5-7 min until the vegetables are soft, adding more broth/water if necessary. In a separate saucepan, bring the rest of the broth/water to a boil. Add the rest of the ingredients (except for salt and pepper) to the big pot with the celery-carrot mix. Stir well, cover with the boiling broth/water until the vegetables are just covered. Let simmer for 25-35 min, adding more broth/water if the chili starts getting too thick. Add salt and pepper towards the end. Fish out the chipotle pepper and discard if you prefer a milder chili. If you like it spicy, cut off 1/2 of the chipotle and mash really well, then add back to the pot. Want it fiery spicy? Mash up and use the whole thing! 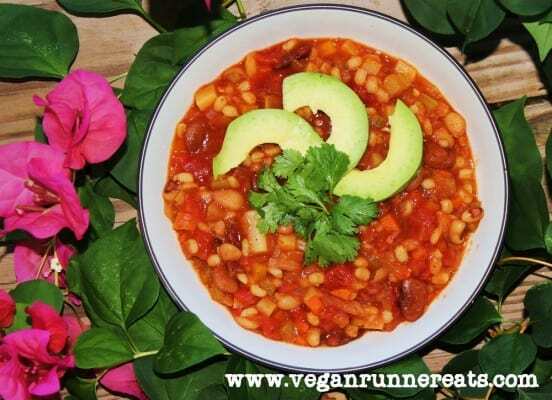 Do you have a favorite vegan chili recipe? Please share with us in comments! Tagged beans, pinto beans, Scott Jurek. Bookmark the permalink.